A statue of David Bowie will be unveiled at Aylesbury Market Square in the UK next Sunday (March 25). Bowie debuted ‘Hunky Dory’ and ‘Ziggy Stardust’ in Aylesbury. A kickstarter campaign raised £115,199 ($161,891) to fund the creation of the Bowie monument. Bowie referenced Aylesbury Market Square in the lyrics to ‘Five Years’ from the Ziggy album. “Pushing through the market square, so many mothers sighing,” he sang. Four months later they returned to the Friars to continue to roadtest songs from ‘Hunky Dory’. 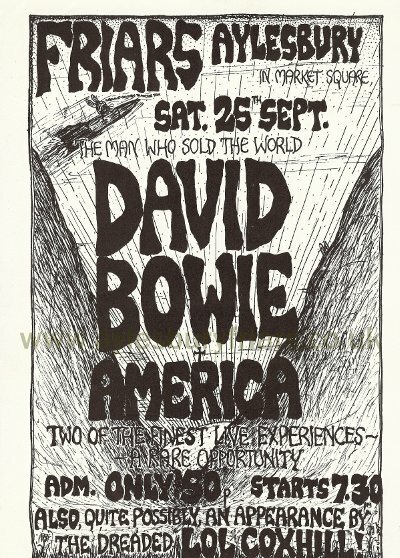 By July the Ziggy persona was revealed and the yet to be released album became the backbone of Bowie’s setlist. Two fans in the audience were the completely unknown Freddie Mercury and Roger Taylor who had just formed their own band Queen. The statue titled ‘Earthly Messenger’ will be dedicated on Sunday. Meanwhile, a petition has started to change the name of the tour from Aylesbury to Aylesbowie.